There are a growing number of companies that will deliver 100% Paleo compliant meals straight to your home or office, no matter where you live. These companies use ingredients you might struggle to find on your own: grass fed/finished beef, pasture raised chicken, eggs and pork, wild caught fish, seasonal organic produce from small local farms and even exotic wild game meats. The days are gone where you must shop at farmers markets and cook for hours to have meals that strictly follow the requirements of the Paleo Diet. Do you sometimes find it challenging to find time to make Paleo compliant meals? Do you wish you had more time for friends and family without sacrificing the health gains you’ve made cutting out processed foods and grains? Although making meals from scratch using the highest quality ingredients available is central to the Paleo Diet and the success many people see with their health, there is no question that locating grass fed, organic and seasonal ingredients and making all dishes, sauces, etc yourself from scratch can be time consuming. Is Paleo Delivery for you? If you are going through a life transition such as having a baby, starting a new job, moving to a new place or are recovering from a health issue. It is difficult or time consuming in your local area to buy organic farmers market produce, grass fed and grass finished meats, pastured pork and poultry and wild caught seafood year round. A number of companies in this article are experts in sourcing these ingredients, with deep partnerships with local farms adhering to the strictest Paleo farming and ranching practices. There are cases where these companies can secure a better price on grass fed and pastured proteins and organic vegetables by partnering directly with farmers in their area when compared to the prices you might get at your local farmers market or health food store. If you live in an area with a higher cost of living such as a city this is even more likely to be the case. Several of these companies are also located in areas where organic produce grows year round, so they have more consistent access to local produce than you might have at your local market if you live in the northern US. You have a friend or family member you believe could see health benefits from going Paleo but worry the learning curve and time commitment required might derail them before they see real benefits. You might encourage them to try one of the 30 day packages offered by these companies as a jump start or even gift them meals as insurance for times when they aren’t able to cook sugar free, grain free meals for themselves. The national Paleo delivery companies covered in this article work hard to include options for Paleo eaters which exclude ingredients such as gluten, dairy, sugars, and unhealthy oils, along with ensuring that as many of their ingredients as possible are seasonal and locally-sourced, just like shopping at a farmers market. Meals are sent directly to your home or office either fresh for frozen depending on the company below. It doesn’t matter if you live in rural Alaska or urban Chicago, with these companies Paleo meal delivery is now available in your area. 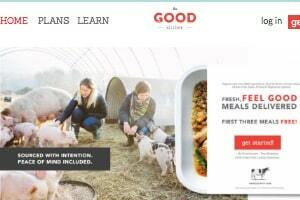 The Good Kitchen, formerly known as modPALEO, focuses as a company on Paleo compliant meals despite their new name. They are devoted to crafting partnerships with farmers and sourcing in-season meals from farms as close to their kitchen as possible. These include grass fed and grass finished beef, pastured pork, antibiotic and hormone free chicken and eggs and seasonal, organic and/or sustainably grown produce. 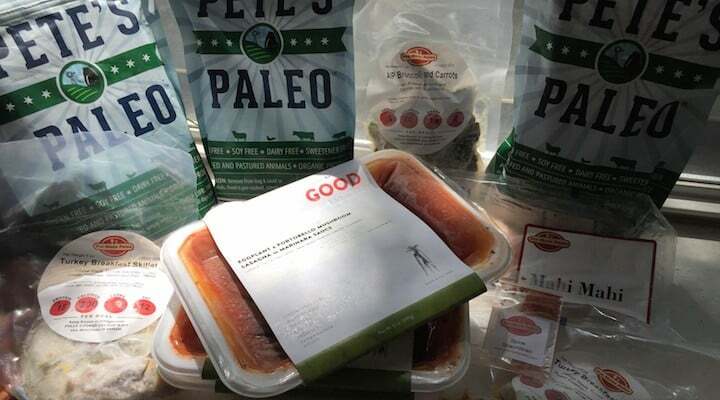 The Good Kitchen is one of the few Paleo Delivery services that offers a portion of their menu items that qualify as Paleo & Vegetarian/Vegan (or Pegan as it is popularly known), a good option for breaking up a week of meat centric meals. In addition, one notable unique offering is their new kids “Lunchbox” menu. This kids menu offers four-compartment kids lunches designed to take to school and made from grain free, organic, grass fed and local ingredients. They recreate kid friendly dishes such as chicken nuggets and spaghetti & meatballs. They also offer relatively adventurous adult Paleo meal recipes in their meal plans, for example tandoori chicken, grilled tomato bruchetta marinara or Vietnamese pork meatballs, and have in the past invited guest chefs from local farm to table restaurants to help them craft new and inspiring meal offerings. They also offer free shipping to all addresses in cooler boxes that use recyclable shipping materials and compostable cooler insulation, with minimum orders as low as 5 meals, and no commitment on meal plans. Ingredient Features: They use organic and seasonal produce in their meals and all beef and pork is grass-fed, grass-finished and pasture raised and poultry is antibiotic and hormone free. Ingredients are sourced responsibly from farmers who share their beliefs in ethical and sustainable farming. 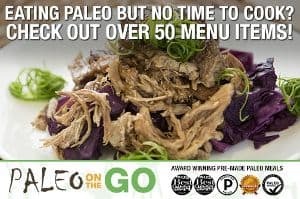 Paleo on the Go takes their Paleo credentials seriously as one of the few Paleo Chef Delivery companies that has ensured a dedicated gluten free kitchen when cooking all meals. In addition, they have multiple Paleo certifications, such as “Certified Paleo”, “Certified Paleo Friendly” and “The Paleo Approach Approved” for the AIP menu items, along with previously winning Paleo Magazine readers choice awards. Meals use grass fed, pastured and wild proteins, and organic produce for all ingredients on the EWG dirty dozen list. They have a long history of offering meal plans for those using Paleo as a healing diet, such as those following the Paleo autoimmune protocol. In fact, they have worked closely with some of the biggest names in the AIP space, such as Sarah Ballantyne from the the Paleo Mom blog and Eileen Laird from the Phoenix Helix blog and others. They also partner with famous cook book authors and bloggers on a number of their recipes. For example, for their Paleo everything bagels they partnered with the creators of The New Yiddish Kitchen cookbook. In addition to staple foods like homemade bone broths, cooking fats and soup stocks, they also offer items to help you feel less deprived on strict diets like AIP Pop Tarts, AIP Pot Pie and Paleo tortillas. Ingredient Features: Organic vegetables if part of the 15 “Dirty Dozen” vegetable/fruit list, other produce conventional to keep prices down. They offer a food sourcing page on their website where they list the names and bios of both local farms they source their ingredients from like Circle C Farms and Three Suns Ranch and more regional farms and suppliers like Pederson’s Natural Farms and Global Organic Specialty Source. Trifecta is a fitness focused meal delivery service committed to meals that contain 100% organic ingredients, from the produce to the proteins, everything. 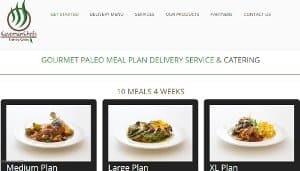 They offer several meal plans but have from day one offered a plan based around the Paleo Diet, designed with input of veterans of the Paleo industry (including the co-founder who has owned multiple Paleo related businesses over the years). In addition to their organic sourcing practices, Trifecta works to source all meat ingredients at or above humane level 5. Trifecta offers free shipping to all 50 US states, with meals delivered in refrigerated cooler boxes so they are fresh and not frozen and are ready to quickly reheat. In addition to their traditional meal plans, they also sell each of their ingredients individually in bulk, pre-cooked and lightly seasoned but not assembled into meals. Ingredients purchased through this Bulk Plan are less expensive and might be a good option if you have trouble consistently buying reasonably priced grass fed meats or organic produce locally. 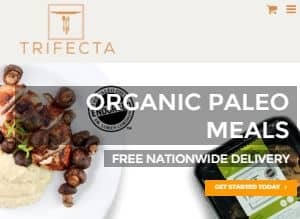 Ingredient Features: All Trifecta meals are made with 100% USDA certified organic ingredients.Meats used in the meals are grass fed and fish are wild-caught. They attempt to source ingredients from local family-run suppliers who use sustainable practices as well. The executive chef and creator of True Fare (formerly Pre Made Paleo), Richard Bradford, is the author of the recipes in the official Whole30 book and writes the ongoing #AskChefRichard column for the Whole30 website. All meals sold through True Fare are Whole30 approved and follow all Paleo guidelines with a subset of meals also designated as AIP. In addition, True Fare has a rotating selection of several more exotic game meats such as Venison, Wild Boar and Bison, as well as a large selection of wild fish such as wild caught Chilean Sea Bass, Grouper and Alaskan Halibut. Originally meals offered by Truefare were all frozen Paleo meals but recently they had introduced a fresh meal line as well. They offer a large number of homemade sauces, spice blends and their own line of snack products such as their pork rinds, which they have branded Galactic Hog Skins, made from U.S. Wellness Heritage pork skins. Delivery: Delivery to all 50 US States, Puerto Rico and Canada in cooler boxes with ice packs and/or dry ice. Ingredient Features: Meal ingredients are all organic in the case of produce and chicken, their beef is grass-fed and grass-finished from US Wellness meats, fish and seafood is wild caught and turkey used in their meals is free range from a local farm. Eatology offers Paleo meal plans that also incorporate a macronutrient balance of proteins, fats and carbohydrates in each meal based on the guidelines of the zone protocol. The focus of the company’s meal plans is on helping you maintain a healthy weight through diet with a particular mission to help counter the rise in obesity rates the in US. Eatology tends to offer very competitively priced meals, grouped into sizes based on blocks, a measurement of the size of each serving. Meals are shipped nationwide from their kitchens in Texas. 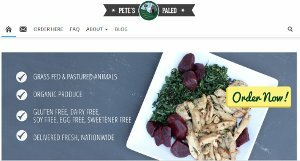 Pete’s Paleo bases their changing weekly menus around produce that is in season at local farms in their area. Meals are kept simple, with the star of the dish being the vegetable or meat in question, often seasoned with broth or herbs to bring out the flavor. Pete’s is unique in that they do not include any sweeteners in their meals, not even honey or maple syrup, instead focusing on the natural sweetness of vegetables or fruit to flavor menu items. This makes them a great option if you are looking to do a detox from sugar. They offer a specific sugar detox plan as well, although all their meal plans would typically qualify as a sugar detox. 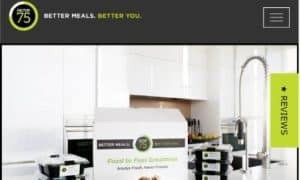 Pete’s is also unique in that they offer a meal plan specifically tailored to those doing the Wahl’s version of Paleo developed by Dr. Terry Wahls, cutting down on a lot of the work sourcing ingredients for this plan. We did receive a report from a reader that they had a reaction to the sodium levels in Pete’s meals, so you may want to review the nutritional information for Pete’s meals (posted on MyFitnessPal) if you are watching your sodium intake. Delivery: US Nationwide, recently expanded to having both a San Diego operation and Atlanta operation. Meals will be shipped from the closest kitchen to your location. Ingredient Features: Produce is organically grown and proteins are grass fed, pastured and sustainably raised. Caveman Chefs is a Denver Paleo Delivery service first started by four friends as a Paleo food truck in Denver which then expanded into a regional Paleo catering service, Denver area Paleo meal service and finally a national Paleo delivery service. 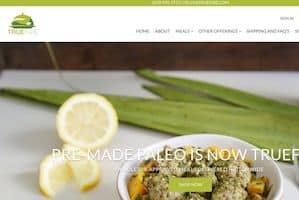 In addition to shipping Paleo meals direct to your door, Caveman Chefs specializes in customizing meals to the requirements of all variations of grain free diets, such as the myriad Paleo-like diets being used for health and wellness. Some examples of diets they have catered to in the past include: low FODMAP, LCHF, Keto, Paleo or Primal, Whole30, AIP and Gluten Free diets. In addition they pride themselves on customizing their weekly meal plans around any particular allergy or special food preferences you might have. 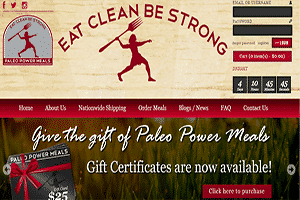 Paleo Power Meals based out of Boston offers Paleo meal plans for Crossfit and other athletes. Although initially a regional company serving the Boston area, they have since expanded to become a nationwide Paleo meal service. Paleo Power Meals focuses on strict Paleo ingredients such as grass fed meats and wild seafood. They offer a la carte ordering with orders over $75 earning incrementally increasing bulk discounts. For those based in the Northeast who want a company based in their region or those looking for a crossfit focused Paleo delivery service, Paleo Power Meals may be a good option. 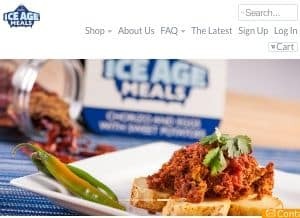 Ice Age Meals, a newer Paleo delivery service based in Reno Nevada, made a splash on the Paleo scene with an appearance on Shark Tank. The executive chef and founder can also be found by his persona on his personal blog, Paleo Nick. Ice Age Meals offers several them based Paleo “Value Pack” meal plans, such as one focusing on international dishes, one with beef centric dishes and one with pork centric dishes. Factor 75, a larger meal delivery service based in Chicago, focuses generally on healthy meal plans. They do however label a portion of their meals as Paleo and allow you to filter their menu to show just those menu items that are. Luckily, a large percentage of the meals tend to be marked as Paleo, and with their options for filtering by different settings “vegetarian”, “paleo”, “dairy free” you can quickly get a list of their meal options that fit your specific dietary requirements. For example, you can mix and match the labels selected, filtering to narrow your list to only “Paleo” and “Vegetarian” meals as one possible combination, although it’s a small list. Ingredient Features: Meats are pasture raised and grass fed and all produce is organic. 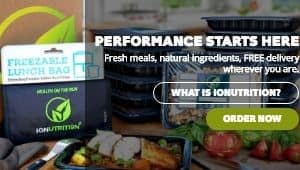 IONutrion is a athletic training focused meal delivery company that offers a Paleo plan as one of their offered meal plans. All plans exclude dairy, gluten, soy and GMOs. Ingredients used in the meals are listed as 100% organic and they promote their use of seasonal ingredients, as well as limiting meals to between 6-12 grams of fat per serving to attempt an ideal balance between protein and carbs. Meals are shipped refrigerated/fresh, with free delivery offered with their meal plans. Meal plans are delivered once a week with an a la carte option available but only based on availability of remaining meals. Meal plans offer 100% Organic ingredients, including their Paleo plan, and all meal plans exclude added sugar. They mention that they use “all natural cage free poultry, wild caught fish, and grass-fed beef and bison”. Meals are delivered refrigerated and non-frozen. 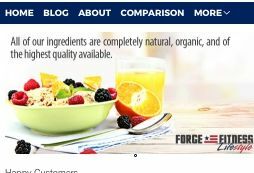 Forge Lifestyle focuses on natural and nutritionally dense food based on farm to table fresh and Organic ingredients. They have several healthful food related plans with one meal plan focusing on following the Paleo Diet. Meals are designed to be low calorie and low sodium – they estimate you would average 1500 calories if eating their meals 3 meals per day. They describe their packaging as 100% plant based and recyclable. Delivery: Meals are delivered fresh/refrigerated. Meals are delivered on Fridays. 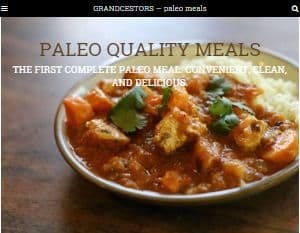 Grandcestors, formerly named Noble Savage, offers a Paleo frozen meal line which is can be both ordered to be shipped to your home or are available in grocery stores in a number of states in the Western US. In order to purchase the meals for delivery you will need to order through the company website or through Amazon. They have partnered with grocery stores in Colorado, Idaho, Kansas, New Mexico, Oregon, Utah and Washington but I thought I recalled seeing them also in the freezer case of a non-chain grocery store in California. The meals look like your standard microwave frozen meals in the freezer case, but contain only Paleo friendly ingredients. They also list protein, fat and carb grams on the packaging for each meal if you are watching your macronutrient balance. Delivery: Frozen Grandcestors meals can be ordered through Amazon or from the Grandcestors website for shipment to any address within the continental 48 US states. Ingredient Features: All meals are cooked in only coconut oil or olive oil. Ingredients for each meal are listed on the package as well as the meal detail page on the Grandcestors website. 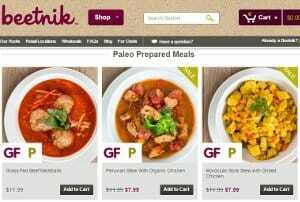 Beetnik Foods offers a line of frozen organic meals, a portion of which are designed to meet the needs of those eating Paleo and are marked certified Paleo Friendly accordingly. The frozen meals are available to be shipped to your door by ordering from their website. In addition they stock the meals at health food stores nationwide. They also sell individual Paleo friendly ingredients, such as grass fed beef, wild caught seafood and free range organic chicken. As some of their meals are organic but not Paleo, make sure to look for meals with the Paleo Friendly logo when making meal choices. Ingredient Features: Meals are made with organic, humanely raised grass fed beef or chicken. I hope this guide has been helpful in enlightening you about all of the great Paleo delivery options available to you. Although cooking homemade meals using all-natural, locally-sourced ingredients remain one of the core ideals of the Paleo lifestyle, everyone has times in their life when achieving this ideal is not always possible. So whether you’re in midst of a big move, caring for a new baby, or just overwhelmed by the demands of your busy schedule, having meals delivered can ensure that following the Paleo diet is not posing a threat to your peace of mind. After all, being healthy is the main objective of the Paleo lifestyle – and too much stress is definitely not healthy. The delivery companies listed above can help relieve your stress, and make the prospect of a Paleo Diet less daunting for those unsure about making the transition. The convenience of the wide variety and reliable shipping offered by the national companies mentioned give you a range of options to make your Paleo experience more manageable. This can help to keep you consistent in your grain free, gluten free, sugar free eating habits, while giving you a new level of variety and convenience in your Paleo lifestyle. Know of any great companies that we missed? Have you tried one or more of these Paleo delivery companies? Please share your experiences or feedback in the comments below.